When Morley wishes for more mothers, he gets exactly what he wishes for, plus a whole lot more. What would you do if your mother has no time to play doll house, or read a bedtime story for you? Would you ask for more mothers (cloned one, perhaps)? I received this children illustrative e-book from Scott Cramer a few weeks ago, and only to have time reading this while I was waiting for my appointment with my OB/GYN. More Mothers is about Morley whose wishes to have more mothers come true because he is not getting enough attention from his mother. Unfortunately, having more mothers never solve Morley’s problem but create more issues in his life. I must say that the story is quite straightforward, and it makes a great bedtime story for the kids. I personally love the ending part where Morley lives happily with a mother, yes, one mother. I like the illustration as it really depicts Morley’s story though I find some dull colours in it. Overall, it’s an interesting children book. Really enjoying reading it (I spent about 15 minutes to finish the book, tho). Scott Cramer is a writer of another two (2) dystopian novels: ‘Night of the Purple Moon’, and ‘Colony East’. 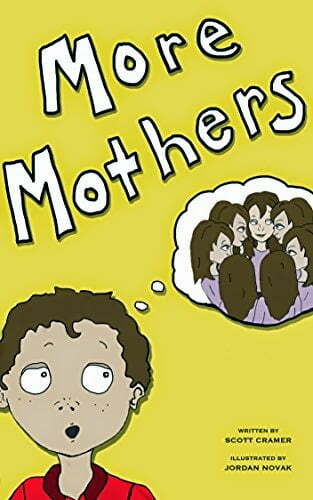 ‘More Mothers’ is his debut children’s illustrative book with a talented artist based in California, Jordan Novak. You can check for more of her art here. Cramer will come with his third book in The Toucan Trilogy, ‘Generation M’, in the near future. You can always get his latest updates by following his Facebook page. You can always get this book here at Amazon.